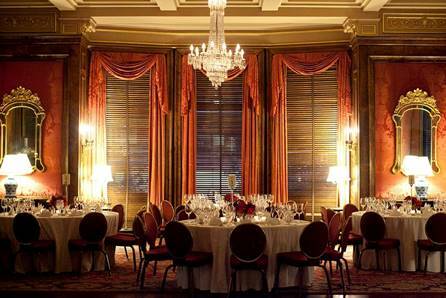 Dinner served at 8:00 p.m., The Red Lounge, Second Floor of the The Metropolitan Club. A meeting of the Officers and Council will be held at 6:00 p.m., The Red Lounge, Second Floor. Speaker: Susan R. Stein, the Richard Gilder Senior Curator Special Projects. Topic Thomas Jefferson, Trancophile and "Enthusiast on the Subject of the Arts"
in the now 925-year history of Lincoln Cathedral. compliance for a division of an international bank. The 77th Annual Dinner and Meeting of the Order was held at the same Club as Last year in DC on Thursday, the 14th of April 2016. Cocktails served at 7:00 p.m. "The Members's Grill First Floor, followed by Dinner at 8:00 p.m. The Red Lounge, second floor. A meeting of the Officers and Council was heldat 6:00 p.m. The 76th Annual Dinner and Meeting of the Order will be held at the same Club as Last year in DC on Thursday, the 16th of April 2015. A meeting of the Officers and Council will beheld at 6:00 p.m. Further details will follow. Our speaker for the Order's 2015 gala dinner,was Dr. Charles C. Lucas. Dr. Charles Lucas, one of our own members and an expert on the Carolingian dynasty in his own right, will be addressing us that evening on the topic, "The Personality of Charlemagne :Warrior or Intellectual?". The 75th Annual Dinner and Meeting of the Order was held at the same Club as Last year in DC on Thursday, the 10th of April 2014. A meeting of the Officers and Council was held at 6:00 p.m. Further details will follow. Meeting of Officers of the Order was held prior to the Dinner. The 74th Annual Dinner and Meeting of the Order was held at the same Club as Last year in DC on Thursday, the 11th of April 2013. A meeting of the Officers and Council was held at 6:00 p.m.
on the 1st floor at 7:00 p.m Dress was white or black tie with decorations for the gentlemen and evening dress for the ladies. The cost is $125.00 per person, including tax and gratuity. Kelly Robert DeVries, Ph.D., Professor of History at Loyola University Maryland will speak on “Charlemagne’s Elephant.” He is a distinguished military historian of the European Middle Ages. He has authored an extensive number of books, articles, and bibliographies. In addition, he has appeared on over 30 television shows on PBS, The History Channel, History International, the Military Channel, and the National Geographical Channel. Recently, he was the General Mark W. Clark Distinguished Visiting Professor at The Citadel in South Carolina and is also Honorary Historical Consultant for the Royal Armories Museum, H.M. Tower of London. 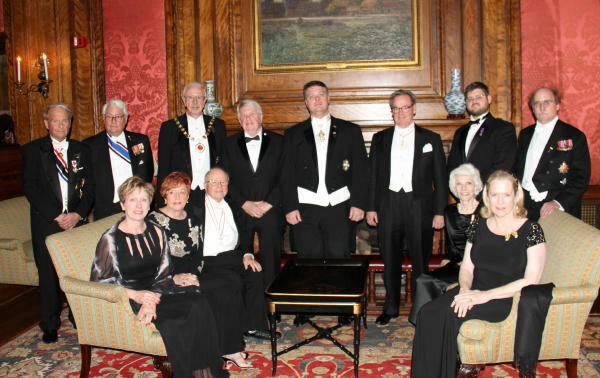 The 73rd Annual Dinner and Meeting of the Order will was held at the same location as last year, courtesy of President General Nicholas Donnell Ward, Esq. ), on Thursday, the 12th of April 2012. A meeting of the Officers and Council was held at 6:00 p.m. Prior to dinner at 8:00 p.m., cocktails were served in the Members’ Grille on the 1st floor at 7:00 p.m. Dress was white or black tie with decorations for the gentlemen and evening dress for the ladies. The cost is $115.00 per person, including tax and gratuity. Former Editor-in-Chief of the American Speaker, a guide to successful speaking, Aram Bakshian, Jr. spoke on “The Future of Monarchy.” Mr. Bakshian has been a professional speech writer for the Republican National Convention, Senator Bob Dole, and Presidents Richard Nixon, Gerald Ford, Jr., and Ronald Reagan. He is a Fellow at the John F. Kennedy School of Politics, authored numerous books, and lectures on history and politics. David and Ginger Hildebrand from The Colonial Music Institute in Maryland will perform colonial popular music known to the governors on harpsichord, violin, guitar, hammered dulcimer and English flute. In addition to publishing music collections, they have performed nationally and in Europe and have performed at Colonial Williamsburg and at Mount Vernon. The 71st Annual Dinner and Meeting of the Order were held in Washington, DC [ at the same places as last year] on Thursday, the 15th of April 2010. A meeting of the Officers and Council will be held at 6:00 p.m.
Neil D. Thompson, Ph.D., L.L.B., C.G., F.A.S.G., F.S.G., was our speaker. The 70th Annual Dinner and Meeting of the Order were held in Washington, DC on Thursday, the 16th of April 2008. A meeting of the Officers and Council will be held at 6:00 p.m. The location of the dinner will be indicated on the invitation you will receive by US mail. To celebrate the 70th year of our founding, we joined our sister organization the Order of the Merovingian Dynasty which will be celebrating their 5th anniversary. In lieu of a speaker, brief messages will be given by Presidents General of both orders. Musical entertainment will be provided by the JG Band throughout the evening. The 69th Annual Dinner and meeting of the Order were held on Thursday, the 10th of April 2008. A meeting of the Officers and Council will be held at 6:00 p.m. The location of the dinner will be indicated on the invitation you will receive by US mail. The 68th Annual Dinner and meeting of the Order were held on Thursday, the 12th of April. The 67th Annual Dinner and meeting of the Order were held at the University Club, 1135 Sixteenth Street, NW, Washington, DC on Thursday, the 13th of April. A meeting of the Officers and Council was held at 6:00 p.m. at which time the election of officers for the 2006-2009 terms will occur. The 66th Annual Dinner and meeting of the Order were held at the University Club, 1135 Sixteenth Street, NW, Washington, DC on Thursday, the 14th of April. A meeting of the Officers and Council was held at 6:00 p.m.
Timothy Field Beard, who served 4 terms as our 10th President General from 1991 – 2003, and who continues as our Genealogist General, will be the guest speaker. As one of America’s foremost genealogists and a lecturer on the subject, Tim‘s program is entitled “The Long Road to Charlemagne” with a question and answer period. The 65th Annual Dinner and meeting of the Order were held at the University Club, 1135 Sixteenth Street, NW, Washington, DC on Thursday, the 15th of April 2004. A meeting of the Officers and Council was held at 6:00 P.M. The 64th Annual Dinner and meeting of the Order were held at the University Club, 1135 Sixteenth Street, NW, Washington, DC on Thursday, the 10th of April. A meeting of the Officers and Council was held at 6:00 p.m.